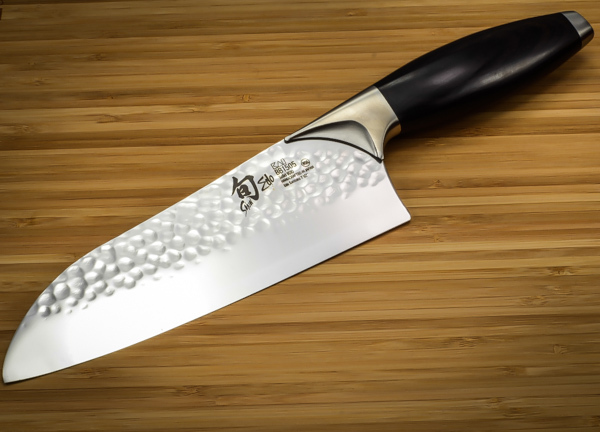 Almost two years ago, I wrote one of the top 5 most popular articles on this site about my brand new Shun Chef’s Knife. I didn’t know it at the time but apparently there are a lot of inquisitive minds out there when it comes to high end knives. At the time, I wrote that article because I was in love with my new Shun Chef’s Knife. I’ve always liked to cook, but that was the first real knife I ever owned and it made a huge difference in the kitchen. If you don’t cook often, then a standard $30 block knife set will probably do you just fine (I actually use one of these in conjunction with my Shun knife). But if you cook as much as one big meal per week, with lots of chopping and cutting, your life will never be the same after a knife like a Shun. I’ve probably used my Shun 1-2 times every single week for the past two years. Now that’s not a ton of use, but my wife has probably also used it once a week for the past two years too. So together, it gets used 2-3 times a week (probably closer to 2) and it’s held up surprisingly well. For those who aren’t aware, the Shun has a very thin but extremely sharp blade. You can cut your finger just by touching the blade, that’s how sharp it is. But since the blade is so thin and sharp, it isn’t meant for cutting things like bones, avocado seeds, etc. This really hasn’t been a problem for me in my two years of ownership and I can only think of a couple times where I had to get a more heavy duty knife out. The only major damage my knife has ever sustained in its two years of existence was a small chip in the center of the blade and a slight bend at the tip. The chip was barely noticeable and didn’t affect cutting at all but it was still kind of an eyesore with a blade as beautiful as a Shun. They say that the best way to test the sharpness of your Shun blade is to see how easily it can cut through the skin of a ripe tomato. It should be able to slice it without much resistance. This is actually a pretty good test and after about a year of ownership my blade could no longer pass. Shun has flip-flopped on its free sharpening policy a couple times but as of today, they currently offer free sharpening. You have to pay for shipping both ways but that’s relatively inexpensive and they have a pretty quick turn around time. I sent in my blade and it came back as good as new within a week or two. They were able to get rid of the chip and straighten the knife out. And the best part was that it was free! I got quite a few recommendations on how to sharpen a Shun knife using a whetstone in the comments section of my last article but for me, all that hassle just isn’t worth it. I only own one Shun (although I’d love another) and it’s a lot easier for me to just mail it in once a year for sharpening than it would be to figure out how to sharpen it using a whet stone. My latest knife purchase was actually a Wusthof bread knife. This might seem like kind of an odd purchase for a second knife but it’s amazing how well these knives can cut bread! I eat a lot of croissants, bagels, etc and it’s tough to cut those suckers without a sharp bread knife. Now I can slice through pretty much any pastry in no time. Going forward, I think I’d like to add one to two more knives to my collection but I have no idea which one. I really like the Shun knives for the more delicate cutting and chopping but I think I prefer Wusthof for the more brute force cutting like with bread, bones and meat! If you have any suggestions for me or feedback about Shun vs Wusthof, I’d love to hear your take in the comments below. What do you think would be the next logical knife pick to help bolster my collection? Is it weird that I really love my bread knife? By the way, if you’re considering buying any of these knives, I receive a small commission if you use any of my Amazon links. Happy Chopping! I use my knives 2,3,4 times a day and need to sharpen them every month. I treat them well and only use them on an end-grain cutting board. 3/4 times a day? That seems like a lot haha. I only really need it for cooking big meals so 2-3 times a week between my wife and I. Make lunch 2-3 times a week (just use a regular knife to spread the mayo/mustard) and then leftovers 1-2 times/week, get take out 2 times a week. You should try meal-prepping, I don’t take it to that extreme of a level but that doesn’t seem very efficient having to prepare food 2-4 times/day. I do a bunch of bulk chopping/cooking and it saves a ton of time and the food I make is healthy and very tasty. I have no experience with Shun… However, Wusthof knives are awesome!!! I own their Santoku knife and a pairing knife and both are great!! I think I lot of people I know that complain about their knives is because they put them in the dish washer… Even cheap knives are decent if you take care of them.. Also, even really good knifes can dull a lot faster when not taken care of. What is your cost on the round trip shipping? About $15? I tend to just use a sharpening steel on mine when I need to hone up the edge a little. Not weird!!! I love and appreciate a good knife that provides a job well done and does it efficiently. Any recommendation for a chopping block(s)? This is a good one. Or you can try and find a deal where they give you a free board when you buy a knife.